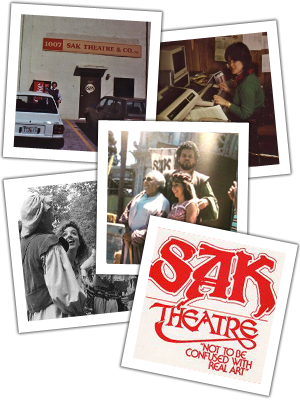 SAK Theatre enjoyed its humble beginnings in Buffalo Minnesota when a troupe of four individuals with a background in evangelical street theater began performing at the Minnesota Renaissance Festival in 1977. After a few years, opportunities arose for SAK to perform at multiple festivals simultaneously. The original troupe trained additional performers and SAK grew from four to twelve. In 1982, while performing at a festival in Largo Florida, entertainment scouts from the Walt Disney Company came looking for entertainment acts to populate the World Showcase at the newly opening EPCOT Center. SAK Theatre Company was now an official corporation and moved its base of operations to Florida. For seven years, SAK produced, performed and managed live audience participatory comedy shows for Walt Disney World in the U.K. and Italy pavilions, as well as countless other shows performed in and around the parks. SAK also continued to appear at festivals, expos and fairs around the world well into the 1990’s, and was employing over 30 full-time performers, production and office staff. In 1991 after the Disney contract ended, SAK Theatre Company opened the SAK Comedy Lab on Church Street in downtown Orlando. This first venue was a 99 seat comedy theater dedicated to performing original comedy plays (many developed through improvisation) and improv shows. It was at this time when the SAK signature improv comedy competition “Duel of Fools” was born. Every Friday and Saturday night for the past 23 years, two teams of improvisers have battled against each other to see who could make up the funniest scenes, sketches and songs based on audience suggestions. It’s been a hilarious bloodbath. Over two decades have passed with two theater moves, and SAK Comedy Lab still thrives in the heart of Downtown Orlando at it’s beautiful 250 seat venue. Since it’s inception in 1991, the “Lab” has grown to become one of the largest theaters and training centers for improvisation in the Southeast. It currently serves over 30,000 patrons a year as well as major Central Florida organizations such as the Orlando Magic, Florida Hospital and Darden Restaurants with its team training and corporate comedy shows. SAK is currently experiencing unprecedented breakaway growth and looks forward to entertaining Orlando audiences for another two decades and beyond. Wayne began improvising and teaching at SAK in 1991. He moved to LA in 1995, got very famous and won three Emmy's. Paula Pell performed with SAK during 80's. She's currently a writer of 16 years for "Saturday Night Live", and a screenwriter and actor on "30 Rock" and "Parks and Recreation”. Jonathan Mangum began improvising at SAK in 1991. He's traveled the world improvising live and on television with Wayne Brady and Drew Carey. Brendan has written and performed in two award winning Second City revues, and his improv group, "Cook County Social Club" was named 2010's best improv group by the Chicago Reader. Brendan is currently in LA working on a pilot with Comedy Central. Paul Vogt worked with SAK in the late 90's. He went on to become a lead actor on Mad TV from 2002-2005. Aaron Shure performed and taught at SAK from 1991-1994. He moved to LA and became a two-time Emmy winning writer and producer for "Everybody Loves Raymond" and "The Office".